Drawing on both color and movement, artist Donna Bernstein creates paintings and sculptures using nature as her muse. Ms. Bernstein, who goes by Donna B Art, creates paintings of horses that aren’t necessarily traditional. “I don’t think of myself as a normal equestrian artist,” she said in a recent interview. 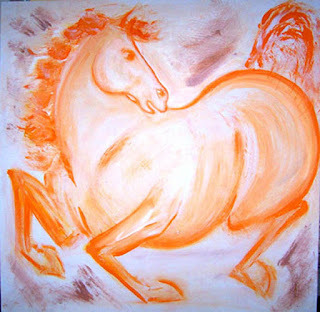 Describing her paintings as contemporary, she uses bright colors in her depiction of horses. After watching the animals move, she brings those images back to her work as she starts to draw. The artist, who also creates abstract pieces, said watching horses is as enjoyable as drawing them. Artists who inspire Ms. Bernstein include, among others, Rosa Bonheur, Georgia O’Keeffe, Picasso, Paul Brown, Wesley Dennis and Sam Savitt. A frequent visitor to New York, she will be in attendance at the Hampton Classic horse show in Bridgehampton, where her works will be featured from Sunday, August 24, through Saturday, August 30. She is represented by Bob Deets of Galerie BelAge. Annona Restaurant in Westhampton Beach will feature Ms. Bernstein’s large-scale paintings through Friday, September 5. Many of her smaller works and bronze sculptures will be shown at the Hampton Classic. “I believe in animal rescue of all kinds,” she said. Amaryllis Farm Equine Rescue takes in horses and ponies that are otherwise destined for the slaughterhouse. 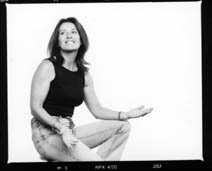 See Donna's other "Contributions and Causes" on this site.